Getting a marriage license may not be the first thing you think of when planning your wedding, but don’t let it be the last! Luckily, there is no waiting period to obtain a license in the state of Missouri and the marriage can take place as soon as it is issued The bride AND groom must be present to apply so finding time in your busy schedules may be your biggest challenge. Many people are surprised to learn that you sign your license at this visit rather than at the ceremony. You may want to “stage” a signing for the photographer on your wedding day (but take a selfie that day as well!). Check the website of the county where you intend to visit for their hours of operation. You and your beloved may have a day off work for Columbus Day, but so will the government office! Ceremony must take place within 30 days of the application. Bring proper government issued identification such as a driver’s license or passport to verify your identity and age. Relax, a blood test isn’t required in Missouri! Make a day of it. Have lunch together and remind yourselves that your wedding day is less than one month away! 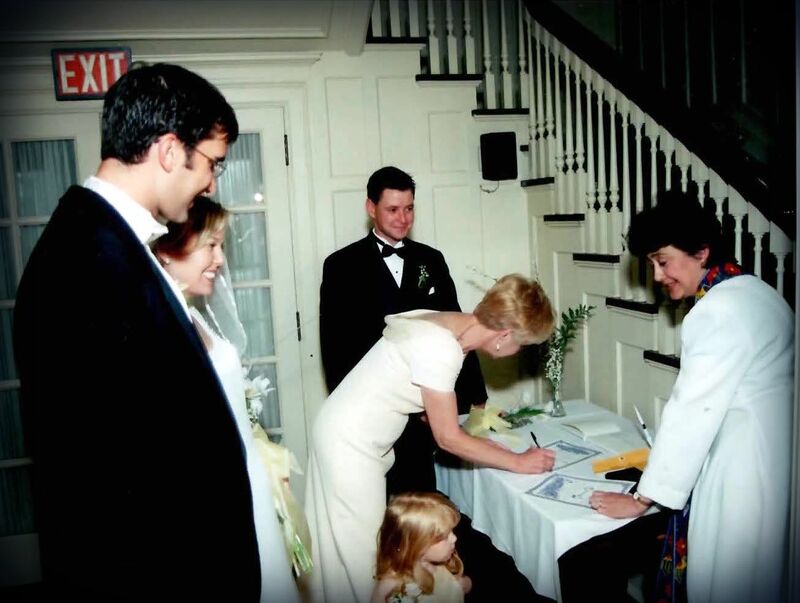 #Throwback to when Cowgirl Christine and Jamie had their marriage licensed signed!